How to pick the right mascara for your lashes. When it comes to purchasing mascara you might scratch your head as to which product to buy. There are so many mascaras to choose from! Aside from trial and error, how can we choose a product that is right for our lashes? The answer lies in the type of formula and the wand. Below are some tips for choosing the right mascara for your fine, sparse, full, or long eyelashes. Mascara formulas come in waterproof, regular, tube, and fiber. Choose the formula that fits your needs the most. Tube –This type of formula basically wraps around each hair to form a waterproof “tube”. Tube mascaras are great for people who have allergies. They are very easy to take off (as compared to waterproof mascaras). The “tubes” simply slide off lashes. Tube mascaras do not build up on the lash easily. It’s hard to get a voluminous look. If not washed off completely, the tubes tend to invade the eyes. Waterproof – Waterproof formulas are created from a mixture of oils (polymers/plastics) which makes them less likely to smear. Waterproof mascara can be worn nearly all situations and stay intact. Good for people who have eye lashes that touch the skin under the eye (some people have bone structure that pushes up the skin under the eye). Good for people who have oily skin types. Oils move around the face and somehow find a way to smudge the mascara. Good for those who have to curl their straight lashes. A waterproof mascara doesn’t contain water (and therefore won’t ruin a curl that is bent into a straight lash). A waterproof mascara is lightweight and won’t weigh your lashes down. . It is difficult to remove. For gentle cleansing, remove with an oil or silicone based makeup remover. Waterproof mascara is made of plastics. These plastics can prematurely break your lashes. Use waterproof mascaras sparingly. It is not water soluble. If a flake gets into the eye, it will not dissolve. People who wear contacts should avoid use. Fibers – Fiber mascaras contains nylon and rayon fibers that add volume and length to lashes. They make your eyelashes look longer. The synthetic fibers attach to lash tips, elongating your natural hairs. They add volume to sparse lashes. The fibers attach to each other and fill in spaces to create the appearance of volume. The lash fibers flake off VERY easily and invade the eye (and can cause an eye infection). Those who wear contacts should avoid fiber mascara altogether. Flakes can leave streaks on your face. The fibers don’t look natural and can appear very clumpy. Regular – Regular mascara is made up of wax, pigment and film formers. Regular mascara is water soluble. Regular mascara easily builds up on the lash with each swipe. Water soluble and easy to cleanse off the lash. Does not flake (usually). If it does flake, it is not detrimental to the eye (because it is water soluble. Rubs off easily (if you tend to rub your eyes). Regular mascara will break down with tears, swimming, rain, sweat, and other water situations. Does not keep lashes curled as well. As you can see, when it comes to mascara formula, you have to take the good with the bad! Now onto the next consideration for picking the right mascara for your lashes: the wand. Below are the types of wands to choose from. 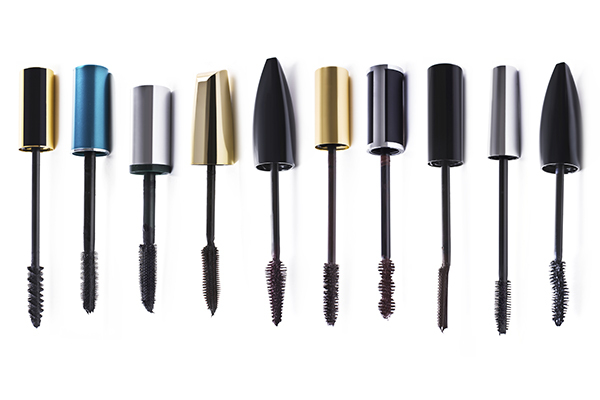 “The right tool for the job” should be your motto when selecting a mascara wand. The brush you choose has a HUGE impact on how the mascara formula swipes on your lashes. Twisted wire brush with close-set bristles: These brushes pick up a LOT of mascara and make it easy to swipe on color in a few strokes. The longer bristles make it easy to apply mascara to the base of the lashes, adding a bold effect. Mascara wands with a twisted wire brush are used to add volume and lengthen the appearance of the lashes. Rubber brushes: This brush is good for people who don’t want to deal with mascara clumps. The brush picks up a smaller amount of product, affording the user more control over the application onto the lashes. These mascara brushes lengthen lashes without adding fullness. Fat wands: These brushes tend to be larger in diameter (especially in the center). The thicker wands can be made out of wire brush or rubber brush and are best for building a lot of volume on the lashes. Curled or hourglass wand: A curled bristle brush and an hourglass rubber brush are perfect for adding a winged effect on your lashes. The curves lift and push your lashes for a dramatic winged effect! Short, close-set bristles that are very uniform (rubber brush, small tip, or comb tip): This type of wand separates the lashes and coats the hairs very evenly. This wand is great for people who have lashes that are long and thick in density (Lucky duckies!). Most mascaras state on their packages the properties of their formula as well as the type of application a wand will result in. Pay attention to the keywords the package lists. A good rule of thumb is to pick a mascara wand based on its shape and the final look you desire. For example: A fat brush will give you fat lashes, a curled brush will help push up your lashes, a small brush with short tips that are uniformly spaced will uniformly coat and separate your lashes. In other words, what you see is what you get! For the expert mascara junkie I suggest combining your mascaras! You do this by first applying your mascara with a brush that adds volume and then follow it with another coat of mascara with a wand that lifts and separates. This technique is pure MAGIC! Another hot tip is to save one of your older mascara tubes that are a little dried out (not too old!). The minimal product makes it easier to apply the right amount of mascara on the lower lashes. You will have less mistakes of clumps or smudges with an older tube of mascara. Remember to dispose your mascara and brush after three months! Once a tube is older than three months you risk getting an eye infection. Please click either link for more information about Louisville hair stylist and makeup artist Jennifer Lee Johnson. ← How to grow out your eyebrows painlessly!